Police Supt. Garry McCarthy chats with Ald. Patrick O'Connor before Friday's hearing on crime stats. CITY HALL — The mayor's top cop faced grilling on crime statistics before a City Council joint committee Friday and got into a conflict over perception and reality on violent crime in Chicago. Supt. 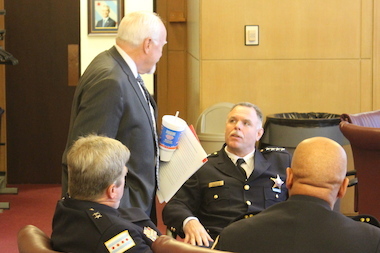 Garry McCarthy defended the Police Department's crime stats in an appearance before the Public Safety Committee and the Committee on Workforce Development. "Accurate data is paramount to what we do," McCarthy testified Friday. He called it "essential to modern-day policing," adding that "residents need to have confidence in us." The council's Progressive Reform Caucus had previously submitted a resolution calling for hearings after media reports and an audit by Inspector General Joseph Ferguson questioned the accuracy of police data. Ald. Patrick O'Connor (40th), chairman of the Workforce Development Committee, called Friday's meeting an "informational hearing." Ald. 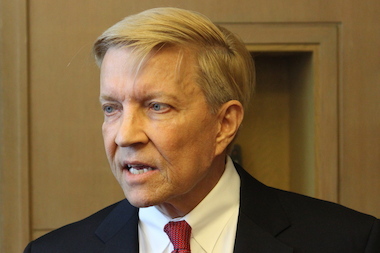 Bob Fioretti said perception is reality when it comes to crime. "It'll bring some clarity," said Ald. Willie Cochran (20th), a former Chicago Police officer. "If there's some deceit going on, we want to uncover it." "If there are mistakes, we will correct them," McCarthy said. "It's real simple. You can't hide bodies." McCarthy fell back on statistics in citing that, through the first seven months of the year, murders were down 7 percent from a year ago, 40 percent from 10 years ago and 55 percent from 20 years ago. He added that the murder rate was the lowest since 1963 and that Chicago ranked 21st in violent crime among major U.S. cities. "It's gonna take us time to overcome perceptions," McCarthy said, estimating it would take five years for perception to catch up with reality. He said it was natural for shell-shocked people living in a violent neighborhood to have a delayed recognition of gradual improvement, but also blamed the media for "a steady drumbeat of shootings, shootings, shootings, murder, murder, murder" and said his department had to do a better job of communicating improvements, with crime stats playing a "critical" role. "We have really sensationalized the situation in Chicago," added Ald. Danny Solis (25th). "It's evident that it makes big national news," McCarthy said, adding that more recent progress had not received the same attention. Yet some aldermen questioned that progress. "People out in the city are living in reality, and they don't like to hear their perceptions are wrong," responded Ald. Scott Waguespack (32nd). "Shootings are now higher than they were last year," said Ald. Bob Fioretti (2nd). He credited the harsh winter for much of the drop in crime stats. "What kind of charade did we see today? "Scott hit it right on the head," Fioretti added. "Perception is reality to the people of this city." "The perceptions over the last five years are trending up," said Ald. Tom Tunney (44th), citing how a certain beat in the Town Hall Police District along Halsted Street had topped the city for robberies. He granted that it was a desirable district for police to work, with a number of senior officers, but added, "Nobody wants to work the midnight shift, which is where the action is." McCarthy credited Town Hall Cmdr. Eli Voulgaris with creating an "entertainment-venue team" that attacked crime along the "Halsted corridor" and had brought robberies down 31 percent this year, with 91 fewer robberies than last year. He added that was an illustration of the district's Comstat tactics, which call for timely, accurate intelligence with crime stats identifying problem areas, rapid deployment to those areas, effective tactics against the given crimes and "relentless follow-up and assessment." Yet Ald. Toni Foulkes (15th) said that made her "a little edgy," in that Englewood was showing improvement with the concentration of police, but she feared that would mean officers being redeployed to new trouble spots. "I'm beginning to think we maybe should have more police," Foulkes added. "Size matters at some point, but I think we are certainly at adequate staffing," McCarthy said. McCarthy identified the Roseland and South Chicago districts as current hot spots, saying, "They are the two that have been bubbling up all year." The Austin District was a third trouble spot, he added. McCarthy called crime statistics "an incredibly important topic, and one that is often misunderstood." He cited police stats posted on the city's Data Portal. "The CPD is a national leader in data transparency," McCarthy said. "This does not exist at other places in the country." He repeated an admission that the department had counted gun assaults by incident rather than by the number of victims, resulting in a lower count, even after state standards set otherwise in 2010. "It slipped by us," McCarthy admitted, and said the department had immediately corrected the discrepancy once the inspector general's audit pointed it out. "We didn't see any evidence that the books were cooked," McCarthy said. He dismissed an article in Chicago magazine suggesting that murders were deliberately underreported, saying, "The allegations in the article are false." He said it compared federal Uniform Crime Report data to local Comstat data the department had compiled, which use completely different definitions of various crimes. "In essence, the magazine was comparing apples and bowling balls," McCarthy said, later adding that the article "has ripped scabs off crime victims." McCarthy defended his "broken windows" initiative, saying, "Preventing the little things prevents the big things. "One of the things we need to overcome is this no-snitch culture," he added. He allowed that police were partly to blame, at one point citing notorious Cmdr. Jon Burge and saying, "We're still paying for it — literally and figuratively," literally with legal settlements, figuratively with police distrust. He mentioned the recent investigation of the murder of Shamiya Adams as an example of the community helping solve the crime. McCarthy insisted he was not criticizing the media, just pointing things out, but talked of how one local TV reporter compared coverage of the Fourth of July weekend this year to 10 years ago, and found that TV coverage on the evening news averaged four and a half minutes for this year's eight murders, but less than a minute for 1994's 12 murders. "We're looking for fairness," McCarthy said. "We're looking for fair reporting." Yet skeptical aldermen were also calling for fairness, with Fioretti saying the three-hour hearing didn't allow time for "the real questions we couldn't ask." He echoed calls for "more police officers, on the street." Ald. Ricardo Munoz (22nd) said the hearing bogged down in "back-office issues ... when what we really need to be talking about is how do we put more officers on the street?" Waguespack invited McCarthy back, and later called for it to happen before annual budget hearings in the fall.